Comments: Shown above is the first page of the service records for John Dickerson in Company C, 19th VA Infantry. He was an Englishman in Scottsville when the Civil War broke out in Virginia in April 1861, and he enlisted in Company C, 19th VA Infantry. John served 15 months in Company C before being discharged by reason of his being a 'Foreigner and having served out his time of enlistment. John Everett Dickerson was born 04 January 1837 in Cambridgeshire, England. He moved to the U.S. and had been in the South for three years before the Civil War broke out, working first as a broom maker, and, when the broom factory burned down, he went into horse breeding. On 17 April 1861, John enlisted as a Private in Company C, 19th Virginia Infantry, in Scottsville, VA, and was mustered into the Confederate Army on 11 May 1861 in Charlottesville, VA.
After the Battle of Bull Run, John served in the Virginia campaigns of 1861 and 1862. His occupation was listed as 'mechanic', and he was detailed for the use of Major Garett in November 1861. John was next detailed as a wagon driver from March - April 1862 and as an ostler for Major Ellis from May-June 1862. At the end of 15 months of service, John was discharged from the 19th VA Infantry in Richmond, VA, on 16 July 1862. The reason given for John's discharge by Lt. C.S. Irving, Commander of Co. C, was that he was 'now entitled to discharge by reason of his being a Foreigner and having served out his time of enlistment.' John was paid $27.86 in salary for his last 2.5 months of service with Co. C and also given $21.50 for clothing. "I certify that the within named John Dickerson, a Private in Capt. Jas. E. Blair's Company 'C' of the Nineteenth VA Volunteers, was born in Cambridgeshire, England, aged 23 years. Five feet five inches high. Dark complexion. Brown Eyes and dark hair, and by occupation a Broom Maker, was enlisted by Capt. Henry Gantt at Scottsville, Albemarle Co., on the 17th day of April 1861 to serve one year and is now entitled to discharge by reason of his being a Foreigner & having served out his time of enlistment." "The said John Dickerson was last paid by (illegible) Geo. F. Jones to include the 30th day of April 1862 and has pay due him from that date to the present date, July 16, 1862." "This is due him: Twenty five/25 dollars in clothing money. He is indebted to the Confederate States three 50/100 dollars on account of clothing." "Given at Camp near Richmond this 16th day July 1862." Received of Capt. Geo. F. Jones, AGMCSA, this 21st of July 1862, Forty-nine dollars and thirty-six cents in full of the above amount. 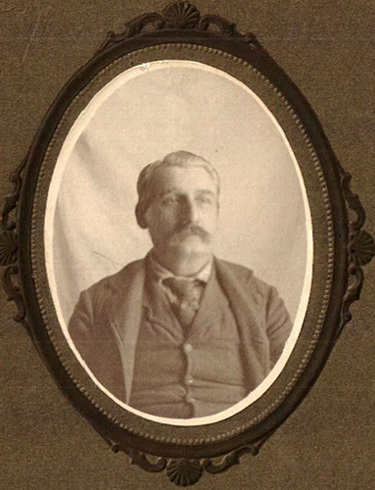 John Dickerson then moved to Tennessee and reenlisted in the Confederate Army by joining Company F, 12nd Battalion of the Tennessee Cavalry, in 1863 where he served as an orderly. John said that towards the last of his service with Co. E, a daily ration for each man was a double handful of cornmeal. John's company was serving in eastern Tennessee in 1865 when they were ordered to reinforce General Lee in Virginia. Enroute to help Lee, Co. E. learned of Lee's surrender to the Union Army. The 12th Battalion, Tennessee Cavalry, then surrendered to Union General Thomas at Knoxville in April 1865, and the conquered Confederates were given free transportation to any point in the North that they might choose. John chose Iowa where his father, Samuel, then lived. John Dickerson was the son of Samuel Dickerson (1813-1893) and Lydia (Everett) Dickerson (1816-1892) of Cambridgeshire, England. John married Emma Amelia Long (1846-1916) in Johnson Country, Iowa, on 20 September 1866, and they had three children: Minnie Maria (1867-1957), Bert George (1873-1934), and Pearl Everett (1875-1939). John had two brothers, Charles and William, who fought in the Union Army during the Civil War as members of the 31st Iowa Infantry. After the Civil War, William Dickerson moved to Eau Claire, Wisconsin, to work in the logging industry. On May 31, 1886, John Dickerson and family moved to Eau Claire to be closer to his favorite younger brother, and William and John actually lived on the same street. John worked as a broom maker for the rest of his life, and he passed away on 25 October 1915 in Eau Claire. 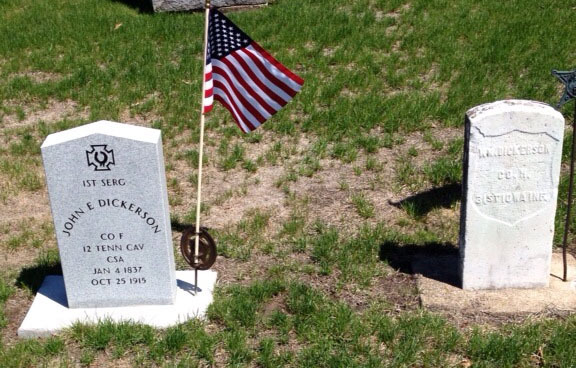 John Dickerson is buried next to his brother, William Dickerson, at Lakeview Cemetery, Eau Claire, Wisconsin. On 09 April 2015, the 150th anniversary of the end of the Civil War, WQOW News 18 of Eau Claire, WI, interviewed Sara Thielen, the great, great, great granddaughter of John Everett Dickerson. To learn more about Sara's research on John and his brother, William, in the Civil War, visit: Eau Claire Family Remembers Civil War Battle of 2 Brothers. 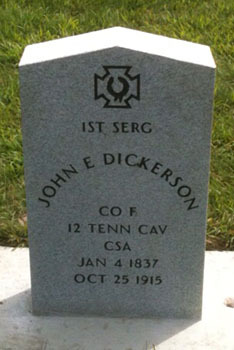 The images of John Dickerson, his service record, discharge paper from Co. C, 19th VA Infantry in 1862, and his gravestone are part of the Sara Dickerson Thielen collection; Sara resides in Eau Claire, Wisconsin. Scottsville Museum wants to thank Sara for contacting us and sharing these photos, military records, and a copy of the Eau Claire newspaper article on John Dickerson entitled "A Johnny Reb in Eau Claire." 1) "A Johnny Reb in Eau Claire", unidentified newspaper in Eau Claire, Wisconsin, dated 1899. Sara Dickerson Thielen Collection, Scottsville Museum, Image No. SDTcd01cdSDT01. 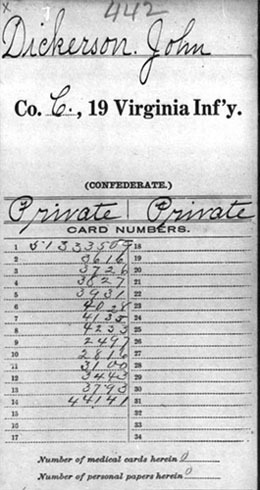 3) 19th VA Infantry Service Record for John Dickerson, Co. C..
4) 22 Battalion (Day's) Tennessee Cavalry Service Record for John Dickerson, Co. F.
5) 1870 U.S. Census, Third Ward and Iowa City, Johnson County, Iowa, p.9. 6) 1880 U.S. Census, Monticello, Jones County, Iowa, p. 318A, Enumeration District 326. 7) 1910 U.S. Census, Eau Claire, Eau Claire County, Wisconsin, Sheet 4B, Enumeration District 53. 8) John Everett Dickerson Family Tree prepared by the Torpey Family, Ancestry.com.